Lakeith Stanfield is about to sit down to dinner in New York, but before he dives into a filet or maybe a whole-roasted branzino, he is on the phone with me, talking about his old hygiene routine. “I was living out of my car in Echo Park, couch surfing wherever I could,” he says of his first year in L.A. (he grew up in San Bernardino). “Every night I’d listen to Jimi Hendrix, wake up, then take a ho bath at McDonald’s.” There is a pause. “A what?” I ask. Stanfield erupts with lazy laughter. “Like, a shower in the sink,” he says, as if he were explaining to a toddler. But those days are long gone. The 27-year-old’s IMDb profile is a young actor’s pipe dream: Bit parts in War Machine and Selma led to meatier roles in Get Out (he screams the titular line) and Atlanta (as “pothead philosopher” Darius, he’s the comic relief in Donald Glover’s surreal universe). 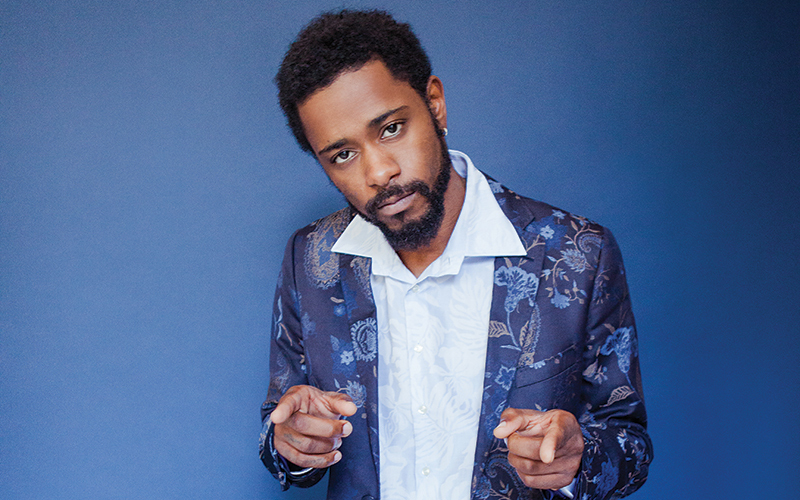 Next up, Stanfield makes the jump to leading man in Sorry to Bother You (July 6), a film from rapper Boots Riley that’s equal parts sci-fi and satire. Stanfield plays a telemarketer whose sales skyrocket when he uses a “white voice” (David Cross’s, as it turns out). Bolstered—but not outshone—by costars like Danny Glover and Armie Hammer, Stanfield is clearly on the cusp of household-name fame. Before he has to think about all that, though, he talks about getting naked and his deep love for Tyler, the Creator. Pick a hype man: Donald Glover or Danny Glover? I do dance. All the time. Angeleno you’d hand-pick as a partner? I don’t think anyone can keep up with me. But if I had to choose someone, I’d pick Tyler, the Creator. He’s a wild boar. If you could have any voice for a day, whose would it be? Yes. That’s a voice you can’t buy. How would you harness the power of Tyler’s voice? I’d try to voice over some cartoon character—I’d want to do something on The Boondocks if it ever came back. How would Darius sum up L.A. in one sentence? “A ball of wasted potential and beautiful, shiny sidewalks,” perhaps. L.A. show you’d do an Atlanta collab with? Insecure. But it’d have to be set in Atlanta—we’ve gotta up the stakes, get everyone in a new environment. Non-network approved name for your late-night show? Um. Like, U-M. It would be a similar format to—who’s that dude with the Afro who invites people on his show and gets naked? Eric Andre. It’d be like that. He gets naked? Or his guests get naked? Would you get naked on your show? I’m sure, at some point. Who doesn’t like nakedness? Rapper you’d hire to write the foreword to your first book? Myself, except I’d write it as Darius. Although he might not have good things to say about it. It’d be fiction—definitely more interesting than my life. I actually was thinking about writing a book this morning. Person you’d anonymously troll on Twitter? I troll a lot of my followers. If you change your name, people believe you are who you say you are. A couple weeks ago I was Mo’Nique. Then I was Cardi B—I took some lines from her interview and posted it, and when you do this, you can say anything. While we’re on this subject, I actually recently changed my online personality to Tyler, the Creator. Did anyone come at you for it? No, I didn’t let ’em catch me.